How is Spanish Learned in Mexico? 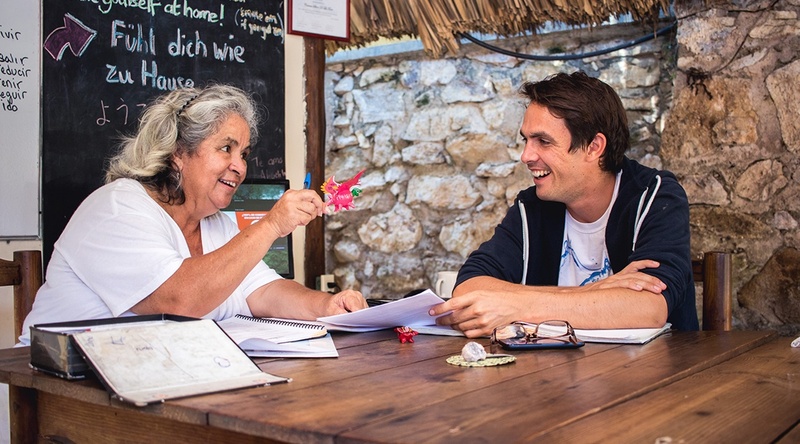 Home > Learn Spanish > How is Spanish Learned in Mexico? 18 Dec How is Spanish Learned in Mexico? John is a student from Britain who, along with his girlfriend Kayleigh, is travelling and learning the language, culture and customs of Mexico. During his studies with Experiencia, he has been keen to develop his knowledge of the more colloquial language and sayings of the young Mexican people. This interest started with an explanation of the world famous Mexican word “wey”. After two weeks of studying the preterite and imperfect tenses, John created a nice story using many different expressions used by Mexicans in every day life. The below translation in English also includes the original expressions in Spanish, as they don’t always translate perfectly into English! When I was travelling in the Philippines last month with the woman who is my “taco di ojo (eng: eye taco)”, many people told me about a great taco place where you could buy “chingones (eng: amazing)” fish tacos that “hacen agua la boca (eng: make your mouth water)”. After ordering the food, I asked Kayleigh “¿muchate? (Eng: sharesies/wanna share? )” and she responded “¡orales! (Eng: let’s do it!)”. So, we tried the fish tacos and “cotorreamos (eng: chatted)” for 20 minutes or so in the restaurant and “de repente (eng: all of a sudden)”, I realised that “me puse colorado (eng: I had gone red)”. Kayleigh looked at me and said “que onda guapo (eng: what’s happening handsome? )” I told her I wasn’t feeling so good and at the same time saw that she had a red face too. Neither of us knew what was going on and our bodies were getting more and more red by the second. “We need to get to the hospital “como el rayo (eng: like lightning”). When we arrived at hospital, the doctor said that we’d eaten poisonous tacos, because the tuna was bad and unhygienic. “¿Que mala onda? (eng: how bad is that? )” We needed an injection straight away, and ten minutes later we were “normales de nuevo (eng: back to normal)”. That night, however, we had nightmares and slept really badly after such a traumatic experience. The next day I woke up really late, but usually “me levanto con el gallo (eng: I get up with the cockerel)”. When Kayleigh awoke she said she was “molido (eng: knackered)” and she couldn’t get up because she was “pegada a las sabanas (eng: glued to the sheets)”. For another week after eating the tacos we weren’t good, “sentíamos del nabo (eng: felt like a turnip)” and were scared it would happen again. However, fortunately everything worked out and now we are in the land of amazing tacos! Andador Revolución #21 Sector Libertad, en el Adoquín 71980 Puerto Escondido, Oaxaca, México.